I realized that April was fast coming to a close, and that means that National Grilled Cheese Month is almost over. Yikes. Now it would be just wrong to not throw one more grilled cheese into the mix for the month. Well, these are sort of grilled cheese. They are open faced grilled cheese or “Tartines” or frankly, they could just be crostini. I think the most important part is the fresh asparagus (it is just so gorgeous this time of year!!) and the salty crispy prosciutto which adds so much flavor and texture. Having said that, These would be just as wonderful vegetarian. 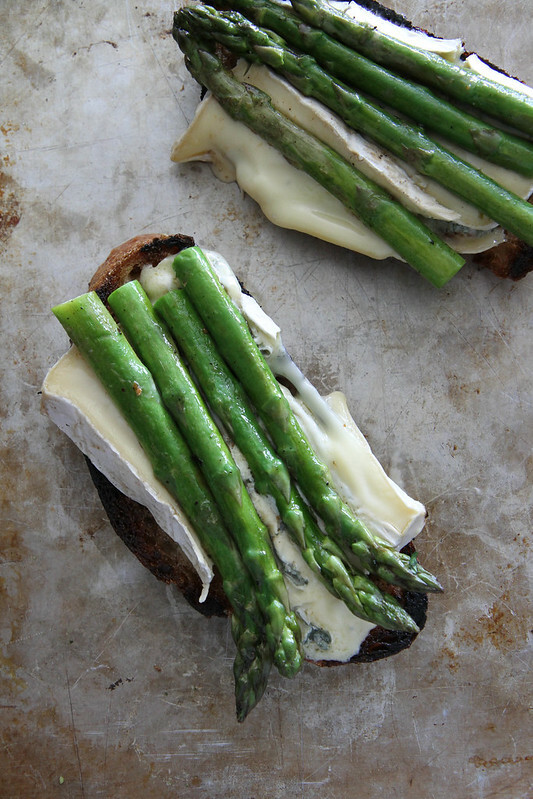 I mean, you kind of can’t go wrong with grilled bread, melted cheese and fresh asparagus. It is a brilliant combo. Reserve 2 tablespoons of the olive oil and drizzle the rest over the bread, oiling both sides of each piece. Grill the bread on both sides until lightly golden and toasted, then set aside. (Leave the grill or pan on medium heat). Rub each slice of bread on both sides with the raw garlic clove, which will turn into a thin layer of garlic paste on the surface of the bread. 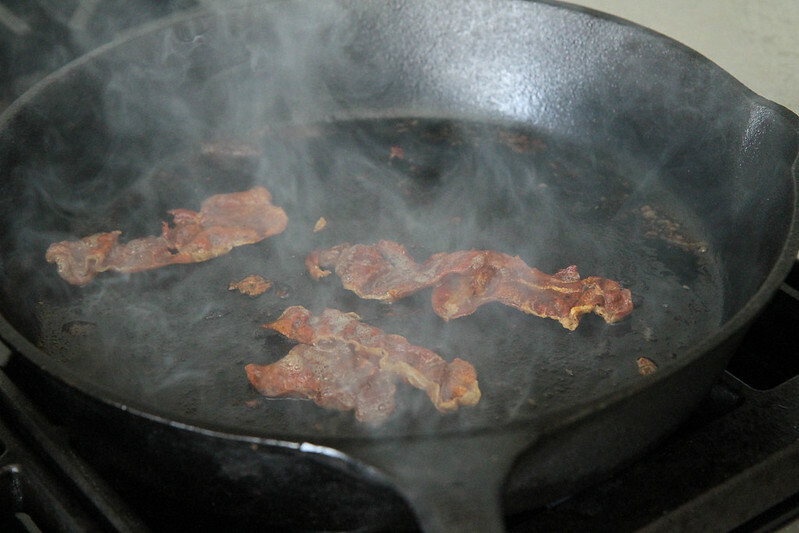 In a heavy skillet, fry the prosciutto over medium-high heat until all of the fat has rendered and the prosciutto is crispy. Set aside. 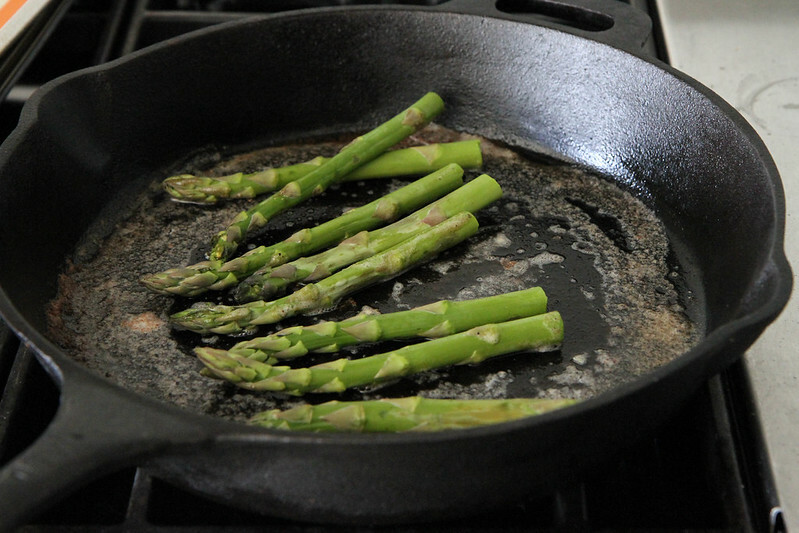 Cook the asparagus in the prosciutto fat pan and sprinkle with salt and grill until tender on the hot grill or grill pan. About 3-4 minutes. Layer two ounces of cheese on each slice of bread and cook in same pan for about 1 minute or JUST until the cheese has started to melt. 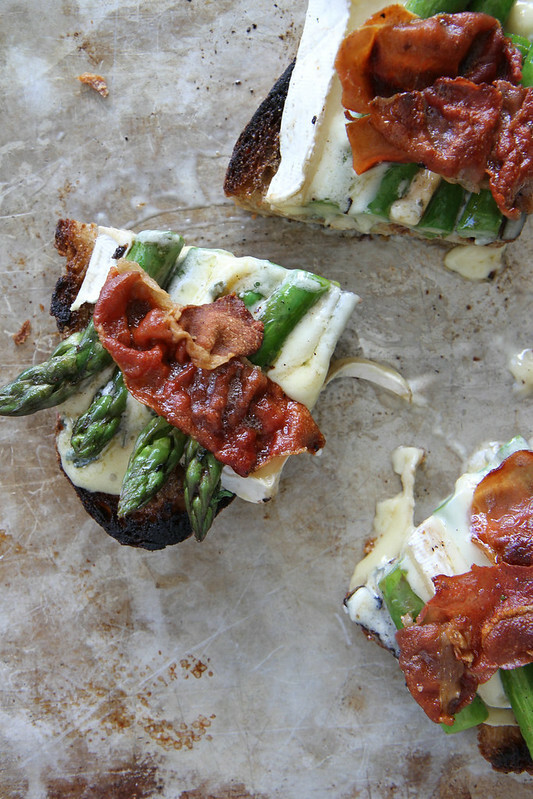 Pile the asparagus on top of the cheese. Put the prosciutto on top. Serve sandwiches hot or slice in half and serve as appetizers. Heat a grill or grill man to medium heat. Layer two ounces of cheese on each slice of bread and cook in same pan for about 1 minute or JUST until the cheese has started to melt. 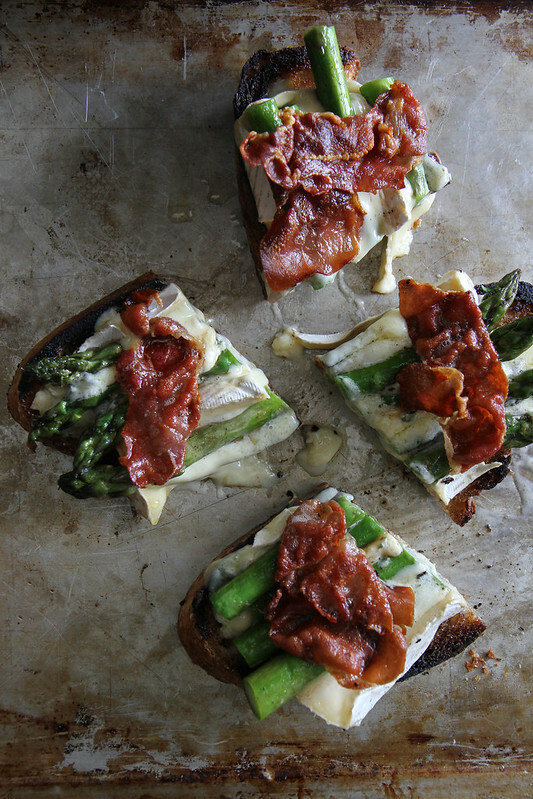 Pile the asparagus on top of the cheese and put the prosciutto on top. 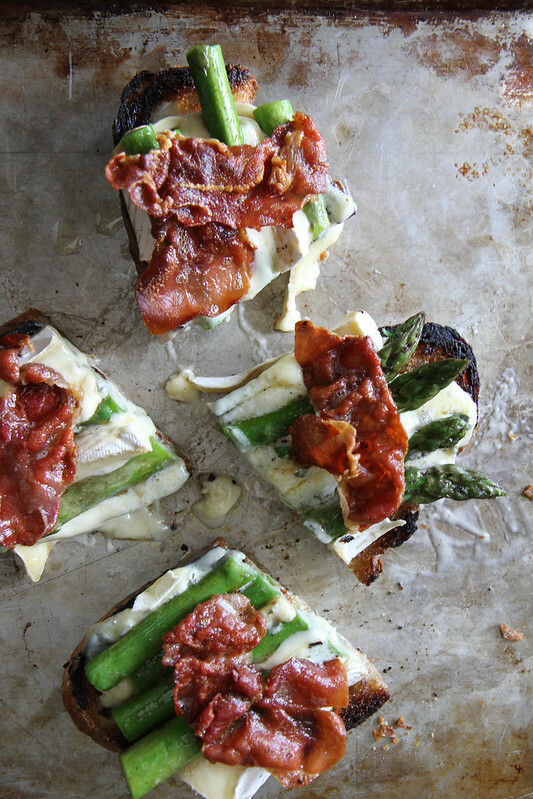 Serve sandwiches hot or slice in half and serve as appetizers. This is incredible! No words other than this needs to be in front of me ASAP! Gorgeous Heather! oh my this is my ultimate grilled cheese!! what a wonderful line up of ingredients! Oh good!! glad you like it Jenny! It has all my favorites on it! I’m in!! This is such a brilliant creation, Heather!! I LOVE that crispy bacon on top!!! Thanks Julie- it is hard to go wring with crispy fried pork, right? Thank you so much GIGI! !love rice noodles! Nothing else will do for lunch today!! oh good Sharon!! I hope you like it! 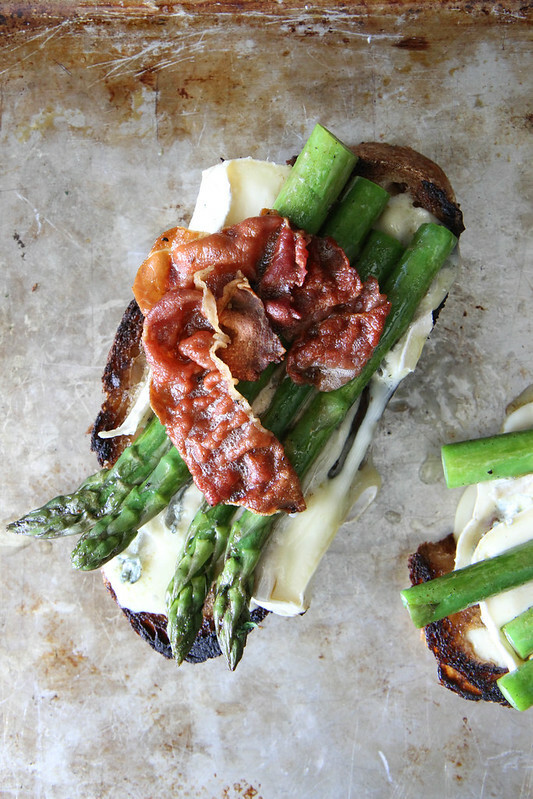 What a killer spring grilled cheese! 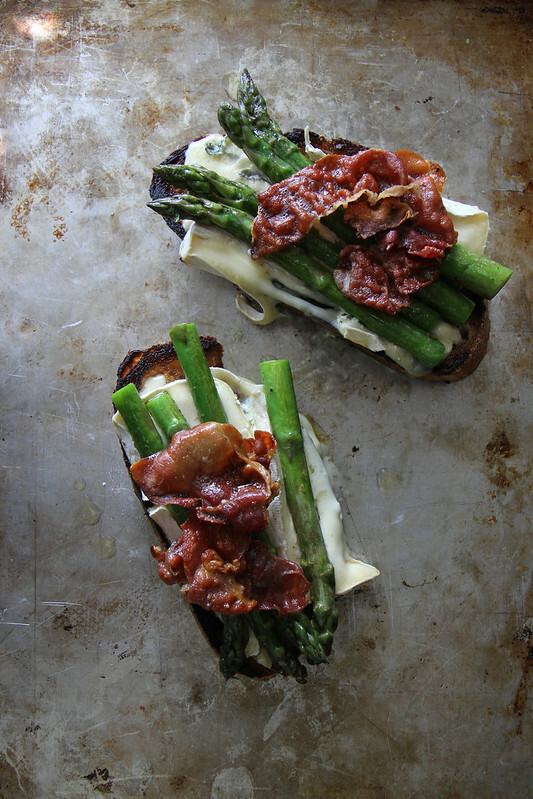 I love how you cooked the asparagus in the prosciutto fat. I really like your style, girl! I spy pig & that makes me very, very happy! Gah! I want this! I didn’t make a single grilled cheese in April. Too sad! 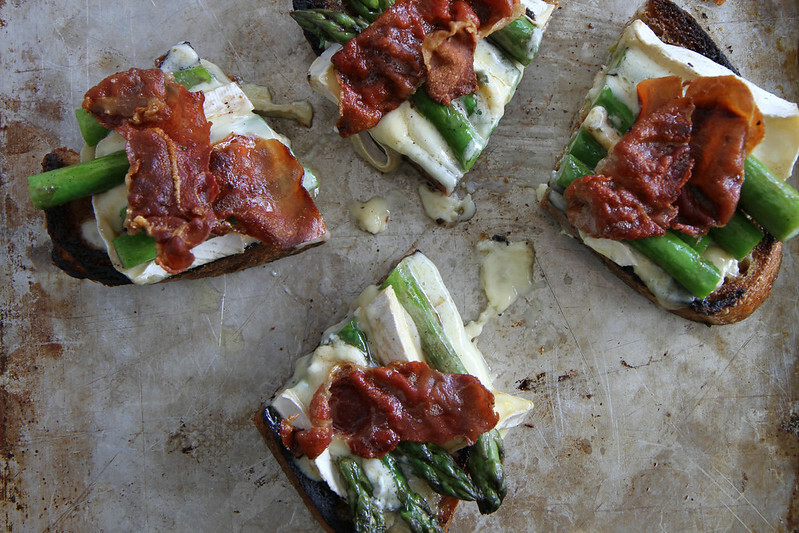 what a brilliant combo – making this as a pizza tonight! I am looking forward to trying this as an appetizer for Easter. Looks delicious. Did no one else read this article? What is a Grill Man? Sorry Laura- it was just a typo- it should say grill Pan. All my favourite things on a slice of toast! Can’t wait to try this mouthwatering recipe. Can not wait to try..Sounds fabulous..
Oh God…Just died and went to heaven!!! Outstanding! The pics are absolutely gorgeous too! Thanks! Putting this on my to-do list! Absolute wonderful light appetizers for people craving something delicious without all the sugars and a healthier way to eat..Quick to put together and have the items on hand..Great for drop in unexpected company..
Ok I have read it all three times … it says reserve 2 tablespoons of the oil … but what for? I can’t see anywhere that you are told to use them! I’m confused!